Palin is in the middle of a low-key trip to the East Coast. (CNN) - In her strongest public remarks to date on the matter, Sarah Palin admonished the Obama adminstration on Saturday for proposing cuts to Alaska's missile defense network, a move she said would leave her state and the rest of the country vulnerable in the case of a future attack. The administration cuts, which were announced by Secretary of Defense Robert Gates in April and would be enacted in the next fiscal year, would trim $1.2 billion from the Pentagon's missile defense programs. The expansion of a missile field in Fort Greely, Alaska would be halted under the proposed budget. "Reducing Alaska's defense readiness in these perilous times is a show of weakness, it is not a sign of strength," Palin said during a celebration in upstate New York honoring native son William Seward, who negotiated the purchase of Alaska in 1867 as Secretary of State. Video of the speech was posted by the Web site "Conservatives4Palin." Palin said Alaska's missile defense system is now more vital than ever, particularly in the wake of North Korea's recent nuclear and missile tests. She said a missile fired from North Korea could easily reach Alaska and other parts of the country. "And yet, Washington thinks it's best now to actually cut defense spending in Alaska by hundreds of millions of dollars," she said. "Now that is an odd priority there." 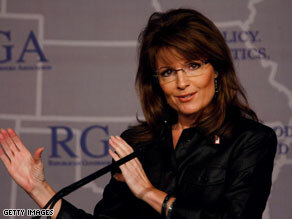 Palin said she will "argue with every ounce of my being for Washington to pay attention." "That is not always easy, but it is right," she said. "It is clear to many that some of our priorities as a nation are kind of reversed, and it is my imperative, and it should be all of our imperative, that we get our government priorities right, because if they are misdirected, obviously America is going turn into something that we don't recognize." At another moment during her speech, the former vice presidential candidate got a cheer from the crowd by repeating a line of attack that was frequently used against Obama during last year's presidential campaign. Palin explained that Alaskans believe in "the roots of our country, so deep, so strong." "They're what we need to cling to," she said. "Clinging to, you know, that includes our clinging to our second amendment rights, and our faith in God. Many of us do cling to that strong faith in God."